Cholesterol deposits around the eyes are a sign of high cholesterol. The condition is also referred to as xanthelasma. Although cholesterol deposits around the eyes may not always signify high cholesterol, it’s still important to check your blood as many other conditions cite this as a symptom. Anyone middle-aged or older can develop cholesterol deposits in the eyes if they have high cholesterol and fat in their blood. This condition is more common among women than men. Causes of cholesterol deposits in the eyes include having high LDL cholesterol and low HDL cholesterol, having familial hypercholesterolemia (a type of high cholesterol that is passed on within families and genes), and having primary biliary cirrhosis, which is a type of liver disease. Research has also suggested that heavy drinking and smoking can contribute to xanthelasma along with making you appear older. What Are the Symptoms of Xanthelasma? The primary symptom of xanthelasma is the appearance of yellow spots in and around the eyes. These spots appear soft, flat, yellowish, and lumpy. The lump will appear near the inner corner of the eyes and can develop symmetrically around both eyes. Some lumps can grow and form together to create a larger lump. Patients rarely experience itchiness or pain and in rare instances, it can lead to changes in vision or a droopy eye. A study looked at 12,745 to explore whether or not xanthelasma could be a predictor of cardiovascular disease risk. Of the group, 4.4 percent had xanthelasma and 24.8 percent had arcus cornea at baseline. During the follow-up period, 1,872 developed myocardial infarction, 3,699 developed ischemic heart disease, 1,498 developed ischemic strokes, 1,815 developed ischemic cerebrovascular diseases, and 8,507 died. 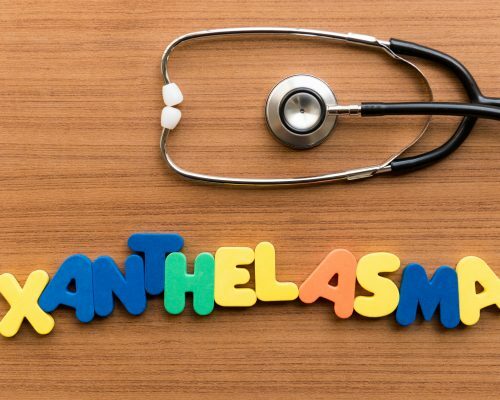 After analysis, the researchers suggest that having xanthelasma could be a predictor of heart attack, heart disease, severe atherosclerosis, and death. On the other hand, arcus cornea was not found to be a predictor of cardiovascular disease. How Are Cholesterol Deposits in the Eyes Diagnosed? Diagnosis of cholesterol deposits in the eyes is generally done through a visual examination along with blood work to check liver function, cholesterol levels, test for diabetes, and assess the patient for cardiovascular disease risk factors. Your doctor may also scrap some of the lumps off for testing to confirm the diagnosis. Cholesterol deposits won’t go away on their own and you will need to see your doctor in order to have them removed. Your doctor may perform a surgical excision where a small blade is used to remove the lump. Chemical cauterization uses chlorinated acetic acids to remove cholesterol deposits. Cryotherapy is where the lump is frozen to be removed. Carbon dioxide and argon laser ablation is less invasive but may lead to discoloring of the skin. Lastly, electrodesiccation which is an electrical needle and is a treatment that is used in part by cryotherapy. Depending on size and severity of the cholesterol deposits that will determine what mode of treatment your doctor uses. Once you have had your cholesterol deposits removed, you will want to ensure they don’t come back. This can be done by reducing your cholesterol levels which can be controlled through diet, exercise, and medications, reduce your alcohol intake, don’t smoke, and increasing your fiber and protein intake. Apple cider vinegar: Apple cider vinegar has been shown to reduce cholesterol, so ingesting it regularly can help bring down LDL cholesterol levels. You can also soak a cotton ball with apple cider vinegar and some water to dilute it and apply it to the area. Coriander: Steep coriander seeds as you would tea for about 10 to 15 minutes and drink the water a few times a day as a means to reduce cholesterol. Orange juice: Orange juice has been found to improve LDL cholesterol numbers, so drinking it a few times a day can help bring down your cholesterol, which is contributing to the deposits around your eyes. Almonds: Consuming tree nuts like almonds have been shown to improve cholesterol. You can also mix some milk with almond powder and apply the paste to the area. If you want to diminish cholesterol deposits around the eyes, reducing cholesterol in your body is essential. This involves eating a healthy diet, exercising regularly, quitting smoking, maintaining a healthy weight, eating fiber-rich foods, minimizing your intake of red meat and dairy products, avoiding alcohol, and eating more fruits and vegetables. If your cholesterol deposits are a result of another condition such as diabetes, it’s important that you properly manage this condition so that your blood lipid levels don’t go up.